Join our Fab Four on 7th September for an exclusive live performance at the iconic Abbey Road Studios featuring the London Philharmonic Orchestra and an appearance from world famous composer, Yoko Shimomura. During the hour-long one-off concert, the London Philharmonic Orchestra will perform live renditions of songs from the FINAL FANTASY XV soundtrack, including previously unheard music from the game. FINAL FANTASY XV composer, Yoko Shimomura (KINGDOM HEARTS series, Street Fighter II), will also offer further insight into the recording of the game’s soundtrack alongside her own commentary of the songs which will be performed. 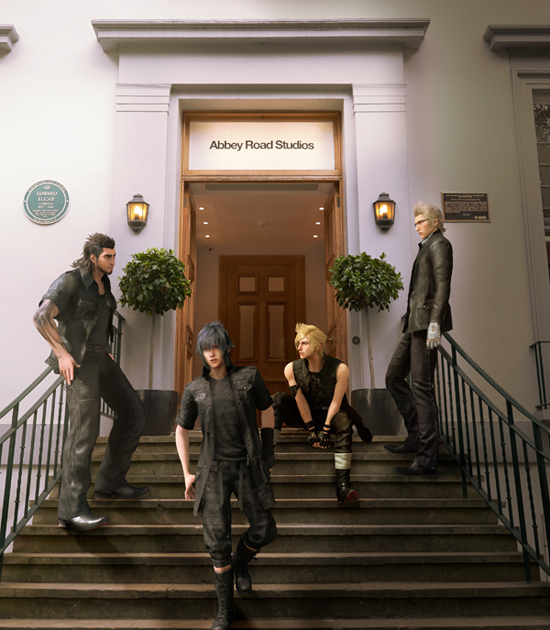 The concert will be broadcasted live worldwide from the iconic Studio One via the FINAL FANTASY XV YouTube channel (https://www.youtube.com/c/finalfantasyxv), and the Square Enix Twitch channel (https://www.twitch.tv/squareenix) from 11:00 a.m. Pacific on Wednesday, September 7th. The full concert will also be uploaded to YouTube straight after the show for those unable to tune-in during the live show. FINAL FANTASY XV will be available November 29th, 2016 for Xbox One and the PlayStation 4 computer entertainment system. Home to countless landmark recordings and pioneering advances in recording technology, the legendary studio complex has a phenomenal history spanning over 80 years, encompassing celebrated work by many of the world’s most famous recording artists including The Beatles, Pink Floyd, Frank Ocean, Florence + The Machine, Radiohead, Oasis, Kanye West, Lady Gaga and Adele. Since the score for Raiders of The Lost Ark was recorded at the studios in 1980, Abbey Road has developed into one of the world’s premiere locations for movie scoring. Blockbuster films such as The Lord of The Rings Trilogy, The King’s Speech and Skyfall feature scores recorded there, while recent projects include the Oscar-winning score to Gravity. Additionally, a number of high-profile video games such as Halo 5 and Call of Duty have recorded in-game music at Abbey Road Studios. The Studios house a number of state of the art mastering suites. Recent projects mastered or re-mastered by Abbey Road’s award-winning engineers include music from Sam Smith, Ed Sheeran, Queen, The Smiths, Depeche Mode, New Order, Mary J Blige. Abbey Road recently launched Abbey Road Red, Europe’s only music-focused technology incubator which supports the endeavours of entrepreneurs, research and developers. Abbey Road Institute recently began offering vocational diplomas in music production and audio engineering to students at the studio complex in London and state of the art facilities in Paris, Berlin, Amsterdam, Munich, Melbourne and Sydney. The London Philharmonic Orchestra has been performing at Southbank Centre’s Royal Festival Hall since it opened in 1951, becoming Resident Orchestra in 1992. It also has residencies in Brighton and Eastbourne, and performs regularly around the UK. The Orchestra frequently tours abroad: highlights of the 2016/17 season include visits to New York, Germany, Hungary, Spain, France, Belgium, The Netherlands and Switzerland.